If you haven’t done so yet. 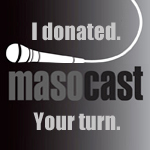 Donate some of your hard earned cash (or ill-gotten-gains) to keep the Masocast Podcast going. Click here for the donation page.